Nails can sometimes seem like another accessory that just happens to be attached to your body. You can keep them short or grow them into some seriously intimidating talons for a more sultry look, and nail polish possibilities are pretty much endless. You can choose between literally every color in the rainbow these days. On top of all of that, you have mountains of nail art tutorials on YouTube and other websites to choose from to get your ideal look. While you're making your nails into your ultimate accessory of self expression, it's important to keep them healthy and strong. If you want your hands looking their best, there are a few things you should never do to your nails. And I mean never. The first step to making your nails look good is keeping them nice and healthy. Even if you have mastered marble nail art, your nails are not going to look good if they keep flaking and cracking every other day. So, before you even start preparing for your nail art, or even if you're just keeping those babies bare, you need to be sure you're staying away from any bad habits or products that could be ruining your nails. If you're thinking about nail health and are not quite sure where to start, take a look at the list below. You should know exactly what not to do before you start doing serious damage. 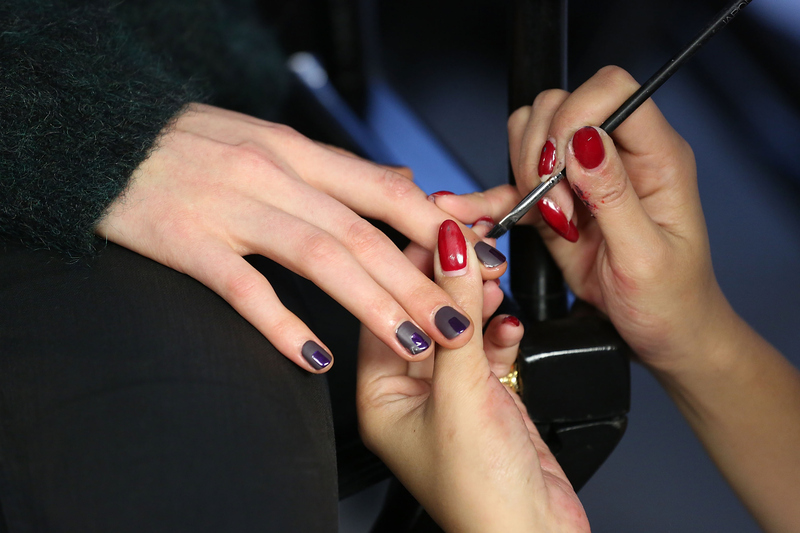 A base coat is essential for having a smooth and long-lasting manicure. Base coats prep the nail for color and can protect it by creating a barrier between your nail and nail polish, according to She Finds. So, basically, your nails will look better with or without polish because of it. If you shower right after painting your nails, you're probably not allowing enough time for the polish to set. The hot water and steam in the shower can make your polish bubble and smudge, according to Daily Makeover. If your nails are looking a little worse for wear, be sure to properly care for them. Dry nails need to be hydrated and weak nails need to be strengthened, according to Cosmopolitan. Try using a hydrating or strengthening base coat and use a cuticle cream or oil to keep you nails looking fab. Although your nails might look dry after 30 minutes, they're not fully dry until 24 hours later, according to Daily Makeover. If you try going to bed right after painting, you're going to end up having sheet imprints al over your newly painted nails. If you need them dry sooner, Daily Makeover suggests you try running your nails under cold water to make them set faster. If you file your nails going in a back and forth motion, you could be creating tiny tears and splits that turn into real cracks in the nail later on, according to Pop Sugar. Instead, try filing your nail in just one direction. If you peel off your nail polish instead of using nail polish remover, you could be causing some serious damage. The act of peeling off polish takes layers of your actual nail with it, especially when its gel polish, according to Cosmopolitan. So, be sure to always use a polish remover to keep your nails safe. If you're a little heavy handed with your nail polish, beware that your thick coats could make it easier to smudge or nick your polish later on, according to Allure. Using a couple thin layers rather than on thick one allows the polish to dry faster, leaving you with better looking nails. Although biting your nails may seem like the perfect stress-reducer, you could be doing some serious damage. Biting nails could weaken the nail or cause serious problems like fungus or infections (no thank you! ), according to The Beautiful Life. Quick dry products may seem like the best thing to use if you want fast drying nails. The problem is in addition to the nail polish, it can make your natural nail dry out faster too, according to PopSugar. Anything with acetone in it can make your nail chip, flake, or peel. So, avoid using anything with acetone unless its a nail polish remover. As nail polish gets older, solvents evaporate which makes the polish become thick and stringy, Daily Makeover reports. This can make applying polish much more difficult, and old polish doesn't grab on to the nail as well, so it might not last as long as new polish. Your nails have dirt and oils on them that can make nail polish harder to hold on to, according to P&G Everyday. Always prep your nails by swiping some nail polish remover to get rid of any dirt or oil that might stand between the polish and your nail. Although you might think cuticles are getting in the way of your perfect manicure, you should never cut them. Cuticles are there for a purpose, so you shouldn't get rid of them because you don't like how they look. Cuticles seal in moisture and act as a barrier to keep germs out of the body, according to the Huffington Post. Just like a base coat doesn't have the shiny properties to act as a top coat, a top coat won't work as a base coat, according to Good Housekeeping. Top coats don't have the sticky properties like a base coat, so it won't be keep the polish on like a base coat would.